Satire Stories and Blah: "Stats-washed"
Three statisticians went hunting in the woods. Before long, one of them pointed to a plump pigeon in a tree, and the three of them stopped and took aim. The first fired, missing the bird by a couple of inches to the left. Immediately afterwards the second fired, but also missed, a couple of inches to the right. The third put down his gun exclaiming, "Great shooting lads, on average I reckon we got it." 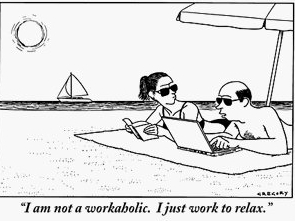 Moral : Don't work too much.You mind becomes mono-directional.Take breaks in life and enjoy it.